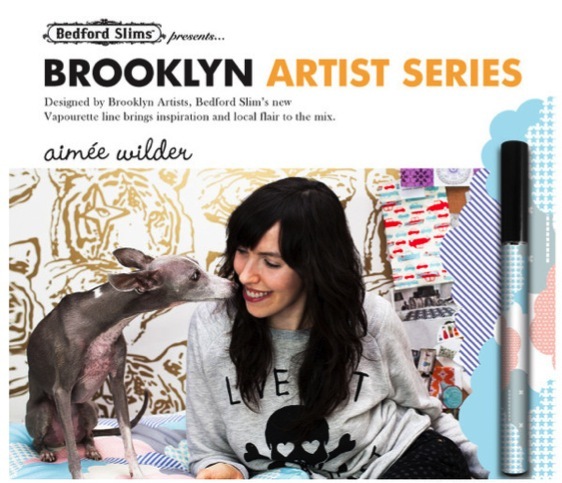 On February 22, Rhizome held This is the ENDD, a one-day forum on the e-cigarette. A version of this article was given by the author as a PowerPoint lecture. Video of the talk can be seen here. Last fall, I spent a month in Arles, a small town in southern France, which has a population of 50,000. This being France, a large number of the residents smoke, and the town has three cafés-tabacs, where you can buy cigarettes. It also sports two different e-cigarette stores, both on the same street, the main drag in the town. It's clear that the stores are not there to sell the cigarettes, but rather, to showcase them. I presume both these stores will not exist in five years (that may be a generous estimate). Whether or not e-cigarettes replace real cigarettes, as many e-cig providers claim, the needs that the vape stores answer will change as our relationships with these objects shift. They are designed for a particular moment in the history of the e-cigarette, when it's still a little out of the ordinary, when we're still not totally sure what to do with it, how to normalize it, and whether or not it's actually here to stay. There is an immediacy, a consistency, to our associations with smoking and cigarettes (good and bad, the Humphrey Bogarts and the health threats); trading them in for an electronic object is a mental leap that's hard to ignore. These stores exist to help consumers make the leap. So how do we sell technology? Enough people have written about the history of Apple making computers and other complex technological objects accessible to the layman. And how the Apple Store made them desirable. 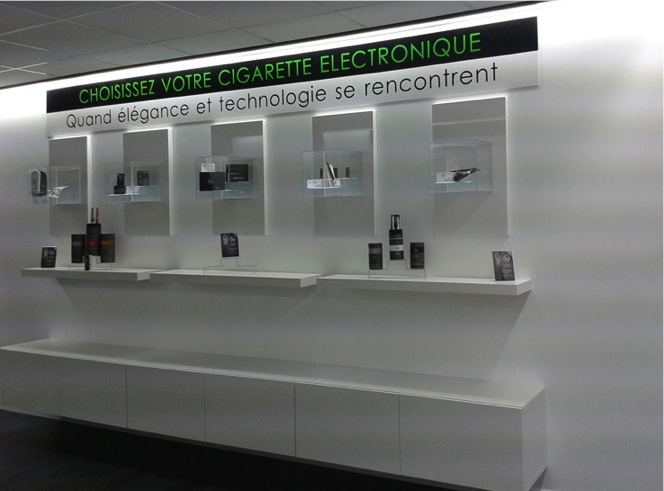 But that was still the first thing that came to my mind when I walked into the French e-cig stores, which are both distinctively minimalist, designed mainly in white, and use materials like plastic and glass. The Apple Store has become a kind of marker for how to sell technology. In fact, the Apple Store shaped the golden rule of retail: More people visit the 300+ Apple Stores in a quarter than all of Disney's theme parks in a year. And bringing people into the store is crucial—the Apple Store makes more per SQF ($4406, last year in average) than Mercedes dealership, Tiffany's on 5th Ave ($3070), or an average Best Buy ($880). But that's not why the Apple Store became so synonymous with the sale of new technology and gadgets. In 2001, when Apple introduced its first store, it looked completely different than any other retail electronics store, which were more like warehouses full of large boxes, cords, and merchandise. Apple then inaugurated its clean, open plan—no clutter, no stock of merchandise on view, and a vista that allows you to see all of the products Apple made at that time in one place, in plain view. But the biggest invention of the store was not a visual one, but a practical one: Ron Johnson, who ran Apple's retail business from 2000–2011 (when he left for JC Penny, where apparently his tech-selling strategies did not translate well into clothes and he was replaced by the person whose position he originally took over two years into the job), devised the idea of the Genius Bar, where dedicated personnel provide immediate support for Apple Products. As Jobs said—"People don't just want to buy personal computers anymore, they want to know what they can do with them." The aesthetics of the Apple Store definitely carried over to many other retail stores, especially in the technology industry, but also in other fields. Some examples I found online were a grocery store in San Francisco that picked up on the Apple Store's roaming cashiers ("What if Apple sold groceries?") and even an article in the Huffington Post about a Denver recreational marijuana store nicknamed "the Apple Store of weed." But, as ubiquitous as the Apple Store design has become in our minds, it's the latter ethos—that consumers want to see how they can use things, what they can do with them—that was adopted to sell us technology, and has been taken up by e-cigarette boutiques. One note here: we are talking about a luxury product. Sure, anyone can buy a cheap e-cig at any bodega, but the specialty e-cigarette store sells brands (many of which are associated with the major tobacco companies—BLU, for example, is owned by Lorillard, which makes Newport cigarettes—but there are still quite a number of independent start-ups) that are more of a premium product, some of which (like Bedford Slims, the artisanal Brooklyn-made e-cigarettes), are clearly marketed to young urban professionals. Not unlike the audience that buys Apple products. But that's not where I'm drawing the comparison from. What started off for me as a purely visual thought experiment about how we represent, sell, and habituate ourselves to technology, became a real interest in how the development of our approach to this particular technology is clear to see in the way it is marketed to us. One of the things I was most curious about when I started looking at images of e-cigarette stores is how quickly their designs shifted from the Apple Store to Whole Foods. The more we adopt this technology, the more its image is presented as organic, closer to a version of the "real"—that is, non-electronic—thing, if it was good for you and came in 47 flavors. In Europe 7% of smokers had tried vaping by 2012 but only 1% of them kept it up. In the US, 1% of the cigarette market is e-cigs. The US is the fastest adopter of e-cigarettes and sales have increased from nearly nothing in 2008 to over $2 billion today. That's exactly why we're seeing a shift in language and approach to this product, one which moves from tech to the organic. E-liquid, for example, has been dubbed "e-juice," another term that brings to mind the natural, healthful world. The less of a novelty e-cigs become, the more suppliers will emphasize this "natural" image. This is also meant to support the health claims that e-cigarette companies make. While there is no definite ruling yet about just how bad inhaling nicotine vapor is, its makers are pushing the e-cig as not a smoking cessation tool, but as a low-risk replacement. And it's advertised as such—advertising that picks up on the long tradition of similar messages from the tobacco industry, as in "doctors prefer Lucky Strikes." You're not supposed to wean off e-cigs the way you would nicotine patches or gum—it's supposed to be a brand new habit. A contemporary one. "Addiction without consequences" as Frank Underwood says in House of Cards (where the e-cigarette product placement was so blatant that no speaker at this conference could ignore it). The more natural the e-cigarette seems, the more healthful. That's why we're seeing a shift in the store designs from minimalist white spaces with plastic furniture, glass displays, and mirrors to chalkboards, wooden walls, and all-natural materials. Take Henley Vaporium in New York. 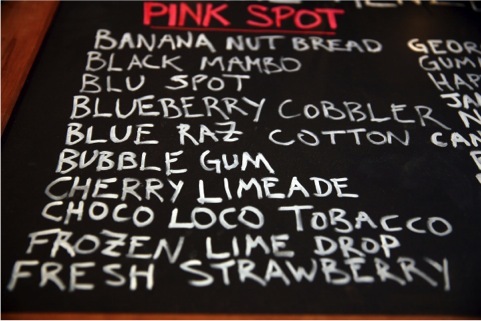 Henley sports a "menu" for e-juices, a café serving Brooklyn-made coffee and tea and offers up free wifi, so that a customer could hang out at the vape lounge smoking, sampling different kind of flavors, spending money. There's one charm of legislation—once vaping is prohibited in public spaces in NYC, you will still be able to smoke in the e-cigarette store. Which means that now Henley has the best of both worlds: It looks like a Whole Food and keeps people in the store in a way similar to the Apple Store's strategy (free internet). And then there's another thing e-cig stores learned from Apple: the Genius Bar. Yelp reviews of e-cigarette stores all discuss the immediacy of going to a shop, discussing what you want with a vendor (Henley calls them "vapologists," that is, Vape Genius Bar), and trying out different flavors and products, rather than shopping for them online. The vapologist can also help you hack your e-cig and accessorize it. While I'm not totally sure what said "hacking" actually entails, it echoes quite strongly with Apple's tight supervision over app developers. E-cigs are one of the first tech-boom products that you would use so directly on the body. And introducing a highly controlled technology to this space seems to go against all the natural claims the store makes. Henley sells its own brand, but other stores seem to go in a similar direction in design and approach. This may be one of the biggest mental leaps we make of giving up real objects in favor of e-objects. As e-cigs are being normalized, even though the jury (the FDA that is) is still out on these, they shift to being presented as organic, rather than technological. This shift is fascinating because it teaches us so much about our approach to technology, which is tested by this product. And this shift is visually represented in the stores that sell us this stuff. I brought up e-food before. Did that seem far-fetched? Maybe. But if it's sold to you in a Whole Foods–like store, won't you reconsider? This isn't about product design—it's about retail conventions and what they stand for. As we experience the e-cigarette in these spaces of representation, as we touch it, test it, and pose with it, we transform our understanding of the practice of smoking and the cigarette as object, and we learn to consume new kinds of materials. I can't tell you where all this is going, but I can tell you what it looks like.